Many Houston Texas homeowners would like to know more about the energy efficiency of their windows. Most of the new replacement windows are labeled to indicate their energy properties but this information may not be available on existing or older windows. Below is an energy efficiency checklist to help you with the process of determining the energy efficiency of your home windows. First try looking for the Energy Star label. The Energy Star label indicates that the window meets energy performance recommendations set by the US Department of Energy. The label includes a map of where the specific window qualifies for the specific climate zone. Windows that are Energy Star qualified should typically meet or exceed energy code requirements for your area. 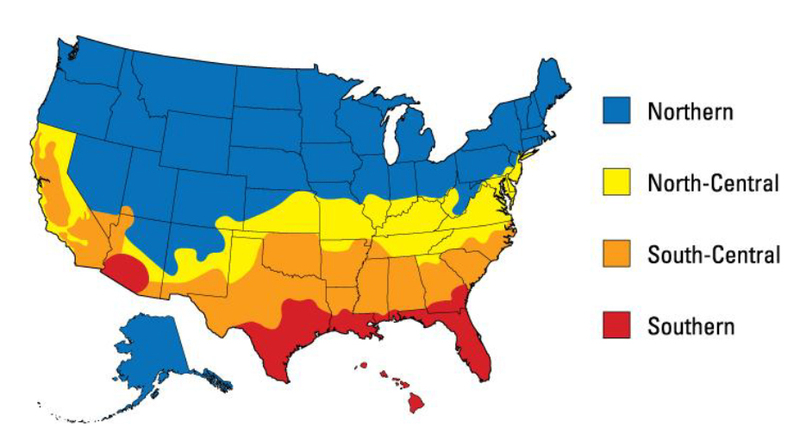 The determining factors for qualification criteria for Energy Star windows is based on your the climate and location of your home. Check for Energy Efficient Properties on the NFRC Label. The National Fenestration Rating Council (NFRC) label is needed for verification of energy code compliance. The NFRC label displays whole-window energy properties and appears on all products in the ENERGY STAR program providing a reliable way to determine the window’s energy efficiency properties. 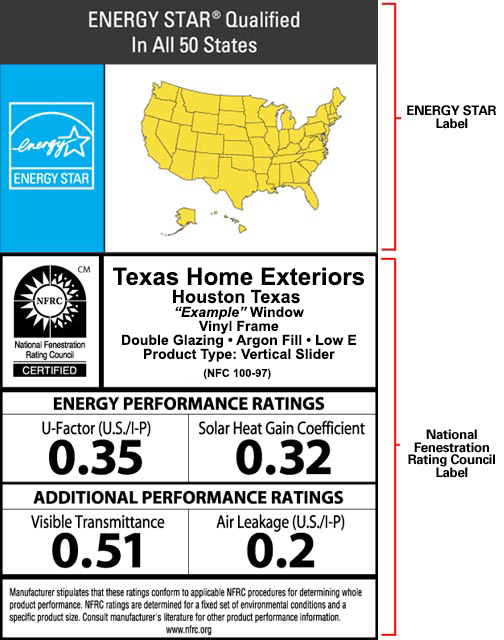 NFRC Energy Star Label Example – The Energy Star label indicates that the window meets energy performance recommendations set by the US Department of Energy. The label includes a map of where the specific window qualifies for the specific climate zone. 2 – What material is the window frame made from (aluminum, wood, vinyl). Windows made with wood or vinyl frames insulate better than metal-framed window options so are more energy efficient. The U-factor and SHGC of a window are shown on the NFRC label. The U-factor is a measure of non-solar heat transfer. A lower U-factor is better, lower means less heat loss. The SHGC indicates how much heat from the sun enters through a window. A low SHGC is more important in the hotter climates like the Houston Texas area. Below is a chart you can reference using the information collected above for the assumed U-factor and SHGC values. This information is based on the International Energy Conservation Code and does not account for features you may not be able to verify such as low-E coatings, gas fills, etc). 3 – Does the window glass has low-E coatings? Low-E coatings are invisible heat barriers that improve window energy efficiency. The most reliable way to identify these coatings is to use a low-E detector device (equipment energy auditors may use). Chances are you do not own one of these but you may be able to identify low-E glass by using a lighter flame or white card by holding either up to the glass and looking for the two reflections from each pane of glass. If one of the panes looks bluer than the other, this is an indication of a low-E coating on that surface. 4 – Does the window have an airtight fit and weatherstripping. Check the sashes and weatherstripping as these are important factors. The windows may have air leakage if they are not fitted tightly or air could be leaking from in between the interface of the frame and the wall if they were not properly sealed during installation. This may be difficult to check for on existing windows. If you are ready to replace your windows, remember the importance of proper installation of your new energy efficient Energy Star rated windows. Proper installation is necessary for optimal performance of energy efficient windows, to ensuring there is an airtight fit and to avoid water leakage. Use experienced professionals for your window selection and installation. Additionally, check the Department of Energy for Tax Incentives for replacing your windows with energy efficient windows that are Energy Star rated. Don’t forget to subscribe to my blog and feel free to call me at Texas Home Exteriors, we are here to assist you in your replacement window selection and installation of new energy efficient windows in the Houston, Spring, The Woodlands metro area. We offer a variety of options, call us today at 281.919.6999 and visit our website click her Texas Home Exteriors. or visit http://texashomeexteriors.net/replacement-windows.html and be sure to check out our Texas Home Exclusive Windows made for the Houston Texas Climate! This entry was posted in Energy Efficiency, Energy Star, Home Improvement, Houston Texas, r-Value, Replacement Windows, Texas Home Exclusive Windows, Texas Home Exteriors, Texas Windows, The Woodlands Texas, Window Options, Window Replacement, Window Types, Windows and tagged energy efficient windows, houston texas, Replacement windows. Bookmark the permalink.